We’d love your help. Let us know what’s wrong with this preview of Doctor Who by David Llewellyn. I'm just wondering if you can bounce around this series, is each book a new separate adventure? Or if you need to read each book in order? I'd like to check it out and I want to do it right...Thanks!! Drew Perron Each one is totally separate! It's okay to bounce around as you like. This is a typical piece of teen Doctor Who and while it is not my cup of tea compared to other books in the range, it wins on one unique feature. This is a perfect Matt Smith episode. He as captured the mannerisms of his Doctor perfectly of which very few can lay claim. You could convince yourself that this was one of your favourite episodes years later only to realise that duh! Recommended for people who want to capture the essence of the new Doctors. This is the first Doctor Who book I've read with Eleven. And I loved it, of course. I love everything Doctor Who related. There is only one thing that bugged me, it's also the reason why I gave it 3 stars in stead of 4. Too many, and something (a lot of the times) it wasn't very clear from which POV I was reading. So that was very confusing. But apart from that I loved it. It was kinda weird to read humans as savages in the year 250.000. You would think we would be extremely smar This is the first Doctor Who book I've read with Eleven. And I loved it, of course. I love everything Doctor Who related. There is only one thing that bugged me, it's also the reason why I gave it 3 stars in stead of 4. So, for a Doctor Who serial based on the TV show (actors and all) and written by someone who is intimately associated with the subject, I would give this five stars. It's a pretty good story for doctor who, not as good as midnight or blink or silence in the library or in the time of angels or the eleventh hour or the impossible planet. But, those were all episodes, so whatever. And this coming from the guy who read Pendragon and Tw So, for a Doctor Who serial based on the TV show (actors and all) and written by someone who is intimately associated with the subject, I would give this five stars. It's a pretty good story for doctor who, not as good as midnight or blink or silence in the library or in the time of angels or the eleventh hour or the impossible planet. But, those were all episodes, so whatever. kinda mad max in space. Еще вчера ты легла спать с мыслью о волнительном событии, предполагающем обмен кольцами и клятвами, а уже сегодня ты пытаешься выжить на космической свалке, населенной варварами. Ты встречаешь инопланетян, таких странных внешне, но понятных на интуитивном уровне. Бросаешь все силы, дабы спасти своего длинноногого спутника, хотя по всем законам жанрам это должен делать он. А еще ты видишь, слышишь, существуешь в тот самый момент, когда целая планета обращается в прах, потому что было выбрано «мен Еще вчера ты легла спать с мыслью о волнительном событии, предполагающем обмен кольцами и клятвами, а уже сегодня ты пытаешься выжить на космической свалке, населенной варварами. Ты встречаешь инопланетян, таких странных внешне, но понятных на интуитивном уровне. Бросаешь все силы, дабы спасти своего длинноногого спутника, хотя по всем законам жанрам это должен делать он. А еще ты видишь, слышишь, существуешь в тот самый момент, когда целая планета обращается в прах, потому что было выбрано «меньшее зло». И с каждым мгновением ты все дальше и дальше от своего «вчера». Удивительная история, разворачивающаяся 250 тысяч лет тому вперед. Космические путешествия стали неотъемлемой частью повседневности, целые планеты и народы открыты исследователями. И космического мусора собралось столько, что под действием гравитации соседних систем он слепился в целую планету-свалку под названием the Gyre. Аномальный объект никого не волновал до тех пор, пока не стало известно, что он находится прямо на траектории кометы Schuler-Khan, и при столкновении ошметки разлетятся так лихо, что заденут или даже уничтожат целые планеты. Был отправлен корабль с нано-бомбой, предназначенной для тихого и безболезненного уничтожения объекта до того, как комета наведается в гости. Но команда корабля застряла на планете и обнаружила там незарегистрированных обитаталей. И речь даже не о противных слизнях, утаскивающих зазевавшихся в болото. А о потомках людей, разбившихся среди этого мусора тысячи лет назад. Причем нынешние «люди», больше похожие на обезьян, искренне верят, что Gyre и есть Земля, выстроили целую религию вокруг вестернов и ждут пришествия Gobo, создавшего все сущее. Когда wordslinger (единственный человек на планете, умеющий читать) рассказывал Доктору легенды о Gobo, меня посетило предчувствие, что книга не закончится хорошо. И я оказалась права, только финал оказался приправлен небольшим разочарованием в Докторе, который сделал в этот раз недостаточно для спасения людей. В тот момент уровень эмоционального накала был таков, что я бы на его месте сорвалась, заорала, а потом обшарила бы все время и пространство, но нашла корабль с логотипом GOBOcorp и заманила туда людей. Совсем не обязательно их любить, чтобы сделать все возможное для их спасения. Не ожидала от докторофраншизы особой глубины, поэтому была готова к легкому и незатейливому приключению с Одиннадцатым. Но нет же. Тут тебе и бомбы. И люди, в процессе деградации скатившиеся до примитивного варварства. Инопланетяне, которые оказываются ближе и надежнее, чем те, с кем делишь корни. Множество ситуаций, у которых по определению не может быть простых решений. Закончила слушать книжку in awe, «Night of the Humans» – это маленький шедевр среди моря посредственных попыток. Отдельное ура Артуру Дарвиллу – он не перестает удивлять меня способностью рассказывать истории так, что забываешь обо всем на свете. Two hundred fifty thousand years in the future, a comet by the name Schuler-Khan is headed straight for the Gyre, a magnetic plain fashioned out of space debris and refuse. A war is waging between the inhabitants of the Gyre, the so-called “humans,” and the Sittuun, a team of aliens armed with a bomb large enough to destroy the Gyre before Schuler-Khan’s impact obliterates the surrounding galaxy. The Doctor and Amy are pulled into the situation when they land on the Gyre at the summons of a myst Two hundred fifty thousand years in the future, a comet by the name Schuler-Khan is headed straight for the Gyre, a magnetic plain fashioned out of space debris and refuse. A war is waging between the inhabitants of the Gyre, the so-called “humans,” and the Sittuun, a team of aliens armed with a bomb large enough to destroy the Gyre before Schuler-Khan’s impact obliterates the surrounding galaxy. The Doctor and Amy are pulled into the situation when they land on the Gyre at the summons of a mysterious distress signal. As suspected, this media tie-in was decent but paled in comparison to the show. Dialogue and characterization lagged, surely due to the freshness of Matt Smith’s incarnation; conversely, it can be seen as the Doctor ‘still cooking,’ as this story took place somewhere after “The Beast Below.” It also explains why more time was devoted to original characters inconsequential to the TV program’s continuity. While separations are common on the show, Amy and the Doctor were apart for over half of the novel and that is too long, especially as their scenes together were priceless, building on the natural chemistry Matt Smith and Karen Gillan bring to their characters’ interaction. The high-five bit was indicative of a friendship still finding its footing, even as the hand-holding moment drew on their intermittent fourteen-year relationship. If I can get my hands on them, I’ll read more of these tie-ins. I am just that enamored with the adventures of this Doctor and his companion. This is more like it! The second brand new Who book with Eleven and Amy Pond reads like a rollicking pulp sci-fi novel, but of course with that true Doctor dilemma that leaves him having to make a choice over the safety of a few versus the safety of many. I hope that the next lot of books are as satisfying as this one. The story-line is rather creative, but I feel like there were several moments that were out-of-character from the TV series. Granted, this was one of the earlier books from the Eleventh Doctor's run so that may be part of the problem. Like, the scene with Amy asking the Doctor if he was jealous of her new friend, I could not see that ever actually being a scene between Amy and the Doctor. It felt more like a conversation between Ten and Rose. Also, the Doctor made a couple very poor decisions ne The story-line is rather creative, but I feel like there were several moments that were out-of-character from the TV series. Granted, this was one of the earlier books from the Eleventh Doctor's run so that may be part of the problem. Like, the scene with Amy asking the Doctor if he was jealous of her new friend, I could not see that ever actually being a scene between Amy and the Doctor. It felt more like a conversation between Ten and Rose. Also, the Doctor made a couple very poor decisions near the end of the book. Why on earth, if you are the only one with the knowledge to do something, would you cave in when the man who wants you to share your knowledge threatens you? I mean, why would that man kill you if you are the only man in the universe who can solve his problem? It's an empty threat. Slipstream was an enjoyable villain, even if he was a bit see-through. I wish he had been a bit more mysterious and I wish it had a taken a while longer to discover that he was a villain. But his posh attitude was quite funny! An interesting premise, with the Tardis materialising on a morass of solidified junk floating in space - rather like the Sargasso Sea. Aliens whose language is so unpronounceable to humans they adopt human names (it was bizarre having aliens with Syrian names, but I got used to it after a while) and whose culture was significantly different from human cultures made a nice change from a lot of DW novels where the aliens seldom have much of a culture to speak of. The plot rolls along at a fair pac An interesting premise, with the Tardis materialising on a morass of solidified junk floating in space - rather like the Sargasso Sea. Aliens whose language is so unpronounceable to humans they adopt human names (it was bizarre having aliens with Syrian names, but I got used to it after a while) and whose culture was significantly different from human cultures made a nice change from a lot of DW novels where the aliens seldom have much of a culture to speak of. Set during the long night before Amy's Wedding, this is an Eleventh Doctor and Amy story, where they encounter interesting aliens and humans. There was a lot I liked about this book; the Sittun, the gyre, the background to the story, but I felt that a couple of the characters were too obviously just there to be killed off horribly, and a few of the allegories were a little too heavy-handed. Snore. This book definitely helped me to sleep. The plot was drivel and just so lackluster. The humans were the enemies and yeah I got it. It had some promise but The 11th Doctor and Amy were separated, which seemed to also mean that their personalities were separated. Dull. I can't even be bothered to write a decent review about this. This was super boring and dry and I didn't like it. A book based on the television series. This one has Matt Smith's Doctor and his companion Amy. In this book, they visit a planet that is basically one giant garbage heap. This planet is about to be hit by a comet that will destroy this planet and set pieces of it throughout space. This was a likable read from this universe. My first point in reading this type of novel is the portrayal of the television characters. The author accomplished this as I had no problem picturing Matt Smith and Karen Gil A book based on the television series. This one has Matt Smith's Doctor and his companion Amy. In this book, they visit a planet that is basically one giant garbage heap. This planet is about to be hit by a comet that will destroy this planet and set pieces of it throughout space. This was a likable read from this universe. My first point in reading this type of novel is the portrayal of the television characters. The author accomplished this as I had no problem picturing Matt Smith and Karen Gillan. I liked the idea of the story of a planet being destroyed and thus causing more problems. There was also a b plot of where inhabitants have devoted themselves to a new religion. This plot wasn't as strong as the main plot. I did like how it shows how aspects can devolve because of incomplete information. I do wish there was a little more time spent on the main plot rather than the sub plot. Let me just preface this review by saying that if Arthur Darvill ever voices a character in an animated movie, I will go to see it, as his reading of this audiobook is so absolutely fantastic. 250,000 years in the future, the planet-sized heap of space junk known as the Gyre is right in the collision path of a massive comet…a comet that, if it collides, will send city-sized chunks of debris hurtling toward multiple nearby planets and possibly destroying billions. Rhythmic drumming echos from an Let me just preface this review by saying that if Arthur Darvill ever voices a character in an animated movie, I will go to see it, as his reading of this audiobook is so absolutely fantastic. 250,000 years in the future, the planet-sized heap of space junk known as the Gyre is right in the collision path of a massive comet…a comet that, if it collides, will send city-sized chunks of debris hurtling toward multiple nearby planets and possibly destroying billions. Rhythmic drumming echos from an encampment next to the ancient wreck of a spaceship, and nearby a stranded crew of aliens have to face the possibility that they must detonate the nanite bomb that would eradicate the Gyre despite the fact that they cannot leave. It is onto this stage that Night of the Humans opens, with the Doctor and Amy intercepting an emergency signal, calling for help. The Doctor, being who he is, can’t resist the draw of a mysterious SOS, and just like that, the story is set in motion. The two aren’t on the planet long before they are separated and captured by two different groups, the Doctor by the humans, and Amy by the strange Sittuun. Due to this separation, the story runs in two parallel paths, switching between Amy’s and the Doctor’s viewpoints, which allowed for some great suspenseful cliffhangers. With Amy in the hands of a species that is racist against humans, and the Doctor at the mercy of humans that have devolved into a cult-like attitude, is it possible for them to re-unite and save not only themselves, but also several billion lives from the ticking time-bomb that they are on? This story includes a plethora of fantastic new characters, including the swashbuckling Dirk Slipstream, who seriously reminded me of a cross between Harry Mudd from from the TOS Star Trek episode “I, Mudd,” and Captain Jack (Sparrow, that is). Although his overbearing charisma is annoying at first, Slipstream really works quite well as a foil to the Doctor, and the hints that they’ve met before make me want to hear more of the untold stories that aren’t on screen. Also introduced in this story is a race of humanoid aliens called the Sittuun, including the stern but well-intentioned Captain Jamal al-Jehedeh of the ship Beagle XXI and his son Lt. Bassim (Charlie) al-Jehedeh. I’ve listened to several Doctor Who audiobooks now, and this one stands out as far as the development of secondary characters goes! I absolutely loved Charlie’s character, who was so deliciously complex, conflicted between his desire to be accepted by his father and his unusual affinity for humans despite the fact that the rest of his race isn’t so keen on them…hmm, who else does this sound like? I think that the thing about Charlie that really won me over, however, was how he named inanimate objects after jazz musicians that he admired. Any character that names his helipod (think hovercraft) after my favorite saxophonist of all time gets an “A” in my book. His subtle flirting with Amy is absolutely fantastic, and works well as a reminder to Amy of what she’s left behind on Earth. Something that I’ve noticed in tie-in novelizations, not only Doctor Who, but across the board, is that the characterizations of the main characters are not always the same as they are portrayed in film. Night of the Humans, however, fits both Amy and the Doctor perfectly personality wise. This story takes place sometime between “Victory of the Daleks” and “Flesh and Stone,” and the author perfectly captures the characters are they were at that point, with the Doctor really starting to get his bearings in his eleventh regeneration, and Amy still concealing what awaits her in the morning. There is some absolutely lovely banter between the two, perfectly capturing the chemistry that exists between Matt Smith and Karen Gillan onscreen. The performance of this audiobook was what really sealed the deal for me with this story, delivered by the amazing Arthur Darvill, who plays Rory in series 5. I must say he matches Matt Smith’s cadences and infections to. a. tee! Absolutely, just wow. It really felt like the character was talking, something that I’ve noticed is lacking in some other audiobooks I’ve listened to. Not only are the title characters wonderfully portrayed, but he also gives unique voices to every character, especially the crazed human by the name of Django. 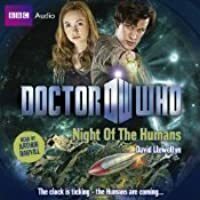 Overall, Night of the Humans is a stellar tie-in novel, a fantastic audiobook to listen to, and a fun story to dive into for a few hours. While I wouldn’t recommend this to any “hard sci-fi” fans out there (granted, I wouldn’t recommend ANY Doctor Who to people that insist in total scientific realism), I’d tell anyone wanting to indulge in the guilty pleasure that is reading tie-in novels that this is a great one to start with. Eh. I read it, but nothing special. In accordance with the FTC, I would like to disclose that I purchased this book. The opinions expressed are mine and no monetary compensation was offered to me by the author or publisher. Thousands of years into our future, Amy Pond and the Doctor follow a distress signal and find themselves on a vast terrain of space junk. Their feet hardly planted, Amy and the Doctor find themselves separated and taken hostage by two separate races – the Sittuun and the Humans. With a comet heading straight for them, Amy must find the Doctor before the comet hits or the Sittuun are forced to obliterate the entire area. If the comet strikes, space junk will be launched towards other planets, causing further destruction. It isn't long until another ship comes to the rescue...but who is Dirk Slipstream and can he be trusted? After consuming 'Trace Memory' by David Llewellyn, I thought it would be fitting that the first Doctor Who novel I read would be one written by him. I managed to find a store with one copy of 'Night of the Humans.' I picked it up but I didn't leave with it. Why? I'd enjoyed his writing enough to give this book a chance. There were a couple of factors: One was the text log at the beginning of the book. I suppose I wanted to be launched straight into the narrative. Another was the absence of Rory. I love Rory and I suppose I wanted to find a Doctor Who book that featured him. Regardless, later that day I had purchased this book...but not in paper form. I bought the audio book and was enamoured by it. I took the chance on it because I learned that all the Doctor Who audio books featuring the Eleventh Doctor were unabridged. When I learned that Arthur Darvill (who plays Rory Williams) narrated 'Night of the Humans' I snatched it up and started listening to it straight away. I got more than I expected. While I was glad to be back with David Llewellyn's writing (bad Keri for playing runaway) it was the dramatization that really brought the book to a whole new level. Once again – as when I read '0.4' by Mike Lancaster – I found myself contemplating the true meaning of "humanity" and what it is to be human. Our view of the term revolves so much in what we know but what if there was a life without fear? What if we had evolved away from planet earth and how would our creationist theories have differed? One thing that this book really targeted is that it is human to want to make sense of things...but in the end, do we want our own truths and what would we do if faced with an alternate stark reality? Arthur Darvill did an excellent job of bringing the tension of the story to life. I was transfixed and always wanting more. I still want more now that the book is at an end. He does the accents for all the characters so well. Even Amy's Scottish accent, which made me giggle at the beginning, was fantastic. Enjoyable. They do a good job of writing in a way that allows you to "see" how it would play out on screen. Questa storia del Doctor Who si colloca dopo il terzo episodio della quinta stagione, L’arma di Churchill. Amy Pond è ancora nuova al mondo del Dottore, avendo viaggiato solamente una volta nel futuro (nel Regno Unito volante sopra la balena spaziale) e una nel passato, in risposta alla chiamata di Churchill. Risulta abbastanza facile collocare la storia temporalmente vista la sua acerbità come compagna, vista l’acerbità pure del Dottore (che ancora sembra stare sperimentando la gestualità del nuo Questa storia del Doctor Who si colloca dopo il terzo episodio della quinta stagione, L’arma di Churchill. Risulta abbastanza facile collocare la storia temporalmente vista la sua acerbità come compagna, vista l’acerbità pure del Dottore (che ancora sembra stare sperimentando la gestualità del nuovo corpo) e visto il suo imbarazzo nel dichiararsi sposata o fidanzata, nel finale della storia quando dichiara che sarà a casa per il suo relativo “domani” (e sappiamo bene che a casa, ha un abito da sposa ed è la vigilia del suo matrimonio con Rory). Mentre leggevo mi sembrava di vedere un episodio della serie tv, anche se c’era la stranezza di Amy e del Dottore che vengono separati appena arrivati sul pianeta e si riuniscono solo alla fine, per la fuga verso il TARDIS. Però la storia, che pure avrebbe potuto penso essere un episodio, non avrebbe creato un episodio indimenticabile. C’è qualche assonanza con La figlia del Dottore, e pure con Utopia. Abbiamo un mondo “discarica” popolato da strane creature come i Sollog (incroci tra ragni e lumache giganti) e sopratutto da umani, discendenti dei cinquecento sopravvissuti di un lontanissimo (nel tempo) naufragio spaziale. Isolati da tutto e tutti da centinaia di migliaia di anni, dimentichi del loro passato, hanno ricreato una società basata sui resti tramandati di generazione in generazione. Film western muti, il logo di un pagliaccio e il nome della compagnia per cui lavoravano i loro antenati. Una società primitiva e selvaggia, formente religiosa. Dall’altra parte abbiamo gli alieni civilizzati, i Sittum, giunti fino a lì per distruggere quella discarica spaziale prima che una cometa la colpisca causando un disastro spaziale che provocherebbe la fine di una dozzina di veri pianeti abitati. Talmente civilizzati da avvisare gli umani dell’imminente collisione e della bomba, una volta scoperta la loro esistenza. E da essere disarmati, consentendo ai primitivi di ucciderli per l’eresia pronunciata: dire che quella non sarebbe la Terra, confondere l’arrivo del loro Dio con la fine del mondo, voler distruggere la terra creata da Dio. Il Dottore e Amy giungono seguendo un segnale di soccorso, ritrovandosi però divisi. Amy con gli alieni, e il Dottore con gli umani. E mentre Amy diventerà loro alleata, il Dottore sarà tacciato di eresia e condannato a morte. In tutto questo compare anche un avventuriero, Slipstream. Giunto al salvataggio degli alieni (con l’astronave in avaria non possono fuggire dal pianeta), del Dottore (su richiesta di Amy) e sopratutto per un proprio scopo personale. Chiarissimo dopo i primi capitoli con lui come coprotagonista. Una storia abbastanza semplice, senza grosse sorprese salvo magari la loro totale assenza. Niente di che, mi aspettavo di più da questo libro. For those who don’t know (Although I can’t imagine there are that many of ya) Doctor Who is a long running British science fiction TV series about an alien, The Doctor, who has a time machine, the TARDIS, that’s disguised as a 1960s style Police telephone box. The Doctor generally travels with companions, who are usually, but not always, human. And this year, 2013, is Doctor Who’s 50th anniversary, so I couldn’t do this 100 Book Challenge without at least one Doctor Who book in it. This book features The Doctor and Amy Pond as portrayed on TV by Matt Smith and Karen Gillan. Following a distress call from around 250,000 years in our future the TARDIS lands on a world made completely out of flattened space junk, called the Gyre, they soon encounter the hostile Sittuun, who take The Doctor and Amy prisoner, however as they’re being taken back to the Sittuun’s crashed spaceship, they’re attacked by a band of savages who kidnap The Doctor. Amy soon learns that the savages are humans, humans who are descended from the survivors of a crashed human spaceship from ages ago, humans who have lost their knowledge of their past, who believe the Gyre is in fact Earth and their great god Gobo will soon come and take them to the sacred place called El Paso. But of more immediate concern is the comet that’s scheduled to strike the Gyre and destroy it, sending debris out into space, to collide with the planets out there, including the Sittuun homeworld. Can Amy, with the help of the Sittuun, rescue The Doctor and save both the Sittuun and the humans? Well, with the help of the space swashbuckler Dirk Slipstream, maybe. But the question is, who can she trust? There's part of me that longs for the days that the Doctor Who books were written for an older audience, and this book is no exception. The introduction had unnecessary confusion, in some extraneous attempt to make the alien race seem more human than the humans on the junk planet. It didn't really help the story, especially since the secondary characters were written well enough—even over-the-top characters like “Dirk Slipstream” (who reminded me of Ace Rimmer with the voice and mustache of Terry There's part of me that longs for the days that the Doctor Who books were written for an older audience, and this book is no exception. The introduction had unnecessary confusion, in some extraneous attempt to make the alien race seem more human than the humans on the junk planet. It didn't really help the story, especially since the secondary characters were written well enough—even over-the-top characters like “Dirk Slipstream” (who reminded me of Ace Rimmer with the voice and mustache of Terry O'Quinn). You might think the story is simply too much if you add in the Pioneer 10 cliché (that satellite gets around in sci-fi universes), overly-blatant anti-religion subtext, and the now common DW rush to the finish (comet hits in 100 minutes, Doctor's at the edge of an acid lake with a spear poking at his back, Amy's outside the enemy base, nanobomb's set to go off, and there's something weird in the Gobocorp ship. Whatever will happen?). Fortunately, where Llewellyn fails with cliché and excess, he succeeds with dialogue and characters. He does a fantastic job of presenting the Doctor and Amy. The voices are spot on, and its easy to see them in this adventure. The Sittuun, the major alien race present in this story, were interesting, if not fully developed. Slipstream is obnoxious at first, but makes for an interesting foil as the story progresses. Amy and the eleventh Doctor travel to a place called The Gyre. It's not even a planet, but rather a place where trash has piled up for thousands of years, creating a harsh planet-like atmosphere. They encounter two civilizations. One is a group of humans, who crashlanded there hundreds of years before and whose civilization took unusual twists and turns based on the Gyre, the leftover Western movies one of the shipmates left behind, and the logo of the company who owned their ship. The other is Amy and the eleventh Doctor travel to a place called The Gyre. It's not even a planet, but rather a place where trash has piled up for thousands of years, creating a harsh planet-like atmosphere. They encounter two civilizations. One is a group of humans, who crashlanded there hundreds of years before and whose civilization took unusual twists and turns based on the Gyre, the leftover Western movies one of the shipmates left behind, and the logo of the company who owned their ship. The other is the Sittuun, an advanced race who use Arabic names and who are conflicted about what to do: their purpose for coming to the Gyre was to destroy it, because a comet is set to hit it and the fragments of the Gyre will threaten the twelve worlds in their solar system, but they didn't know humans were living there, and their attempts to warn the humans have ended tragically. This was an intriguing book, somewhat different from the other Doctor Who tie-in novels which I've read. The voices of Eleven and Amy didn't always match up with them as they are in the TV show, but this was one of the early Eleven DW novels and I think it was released before Series 5 had fully aired. 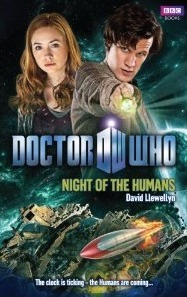 Night of the Humans is part of BBC Book's collection of novels based around the TV Series and features the 11th Doctor and Amy. Landing on a junkyard in space they find themselves caught in between a battle between two alien societies, the Sittuum and a futuristic but savage version of Humans. A devastating comet is on it's way to cause imminent destruction and they face a race against time to save themselves and everybody else. This is a fun and quick read and I found it much more readable tha Night of the Humans is part of BBC Book's collection of novels based around the TV Series and features the 11th Doctor and Amy. Landing on a junkyard in space they find themselves caught in between a battle between two alien societies, the Sittuum and a futuristic but savage version of Humans. A devastating comet is on it's way to cause imminent destruction and they face a race against time to save themselves and everybody else. This is a fun and quick read and I found it much more readable than my previous encounter with BBC Doctor Who books. I really liked the alien world of the Gyre and without being overly convoluted or boring the plot kept my interest and felt like a throwback to the classic series that I gew up with. There are lots of cool aliens and a good balance of action and humour that will probably satisfy many a Whovian. Lots of good characters abound and I particularly liked Dirk Slipstream who (in my mind at least) was definitely Ace Rimmer from Red Dwarf! I grew up with the old Target books and although as an old git I don't get as excited (as I used to) with reading this kind of thing, it was an average entertaining read. A good beginning, a good middle and a decent ending. What more could you want? Night of the Humans is one of the Doctor Who novelizations, in case you haven't already figured that out. It starts with a log from a ship that has crash landed and how day by day they are losing more members of the crew. The log ends with "The humans are coming." The Doctor and Amy pick up a distress signal through space and time. Of course, this is still technically the Doctor, so he goes to rescue them. It turns out that the ship crashed on what is basically a large pile of space junk and the Night of the Humans is one of the Doctor Who novelizations, in case you haven't already figured that out. It starts with a log from a ship that has crash landed and how day by day they are losing more members of the crew. It turns out that the ship crashed on what is basically a large pile of space junk and the humans referred to in the "humans are coming" are actually people who crashed hundreds of years before and have devolved. They now worship what they think is god. And they have kidnapped the Doctor. It goes on from there. A solid, satisfying story that is by turns clever and surprisingly gritty. The gyre itself - a giant, swirling vortex of trash in deep space - is an excellent setting for a novel. The constraints of the SF budget limit deep space stories like this and it's always a pleasure to see an author taking advantage of the cheap special effects at their disposal. Llewellyn likes to turn assumptions on their head. Adult readers may not his concepts particularly ground-breaking but they do add a refreshing A solid, satisfying story that is by turns clever and surprisingly gritty. The gyre itself - a giant, swirling vortex of trash in deep space - is an excellent setting for a novel. The constraints of the SF budget limit deep space stories like this and it's always a pleasure to see an author taking advantage of the cheap special effects at their disposal. Llewellyn likes to turn assumptions on their head. Adult readers may not his concepts particularly ground-breaking but they do add a refreshing depth to the story. It's also surprisingly bleak as the various characters and parties march towards their doom. Amy and the Doctor are well-characterized and have some very nice scenes, with banter, even. Although they really do spend too much time apart, I can report that Amy is written true to her character on the show and doesn't spend much (if any) time asking the Doctor 'what's going on' or 'what are we going to do'. Ne'er have I cared so little about every character in a Who novel before. Nothing grabbed me about Night if the Humans. I truly didn't care about who lived and who got eaten by slugs. The writing itself was fine, and all the mechanics were there, but for me it didn't actually get me into the story at all. Amy is amazingly un-amyish, the antagonists were cookie cutter, and the support team were boring. Any attempt to give them depth was negated by the fact that most of them died 3 pages later. Ev Ne'er have I cared so little about every character in a Who novel before. Nothing grabbed me about Night if the Humans. I truly didn't care about who lived and who got eaten by slugs. The writing itself was fine, and all the mechanics were there, but for me it didn't actually get me into the story at all. Amy is amazingly un-amyish, the antagonists were cookie cutter, and the support team were boring. Any attempt to give them depth was negated by the fact that most of them died 3 pages later. Even Slipstream (or was it starshine, eh) was utterly 2 dimensional. All he was missing was a cape and twistable moustache. The only saving grace to this book is that it is the first one with the 11th doctor that actually got him right. The dialogue and interaction the Doctor had in this book was absolutely perfect. It's a shame the rest of the book fell so flat around him. It was definitely an interesting read, but I did find it a little difficult to get into at first. I didn't particularly empathise with any of the characters aside from Amy and the Doctor, obviously, but I did feel incredibly bad for the humans that were living on the planet. The ending I feel was expected, with those that you thought would survive doing so. This book very much reminded me of The Doctor's Daughter, with the two sides, and being influenced by those generations before them. And I al It was definitely an interesting read, but I did find it a little difficult to get into at first. I didn't particularly empathise with any of the characters aside from Amy and the Doctor, obviously, but I did feel incredibly bad for the humans that were living on the planet. The ending I feel was expected, with those that you thought would survive doing so. This book was pretty ridiculous, even by Doctor Who standards. It's a shame, since the idea of a cosmic junk pile forming at some kind of libration point is actually a great idea, and could have been exploited quite nicely in an entirely different story. Unfortunately, throwing some sort of mystical key that wreaks havoc with gravity, a cult of clown-worshipping humans, and other ludicrous indigenous lifeforms and terrain just botch the job horribly. Now Dirk Slipstream, he's a character that wou This book was pretty ridiculous, even by Doctor Who standards. It's a shame, since the idea of a cosmic junk pile forming at some kind of libration point is actually a great idea, and could have been exploited quite nicely in an entirely different story. Unfortunately, throwing some sort of mystical key that wreaks havoc with gravity, a cult of clown-worshipping humans, and other ludicrous indigenous lifeforms and terrain just botch the job horribly. Now Dirk Slipstream, he's a character that would be worth exploring again...sort of an evil Jack Harkness. His backstory with The Doctor was kind of fascinating, and developed enough that I checked the web to see if he originated in another medium, but he appears to be an entirely original creation for Night of the Humans. Je ne suis pas une experte Whovian, mais ça se sent que l'auteur a travaillé étroitement avec la Production (comme il le précise à la fin du livre). J'ai vraiment eu l'impression de voir un épisode de la série. La couverture représentant Matt Smith, je n'ai eu aucun mal à visualiser ses expressions, mimiques et attitudes. L'écriture est fluide, l'humour intacte, et le rythme assez soutenu pour qu'on ne s'ennuie pas. Mon seul regret (par rapport à la série télévisée) reste l'absence des séquences Je ne suis pas une experte Whovian, mais ça se sent que l'auteur a travaillé étroitement avec la Production (comme il le précise à la fin du livre). Mon seul regret (par rapport à la série télévisée) reste l'absence des séquences marquant le début et la fins des épisodes, quand le Docteur cherche (dans ce cas-là) Amy et la redépose chez elle. David Llewellyn is a Welsh novelist and script writer. He grew up in Pontypool and graduated from Dartington College of Arts in 2000. His first novel, Eleven, was published by Seren Press in 2006. His second, Trace Memory, a spin-off from the BBC drama series Torchwood, was published in March 2008. Everything Is Sinister was published by Seren in May 2008. He has written two novels for the Doctor David Llewellyn is a Welsh novelist and script writer. He grew up in Pontypool and graduated from Dartington College of Arts in 2000. His first novel, Eleven, was published by Seren Press in 2006. His second, Trace Memory, a spin-off from the BBC drama series Torchwood, was published in March 2008. Everything Is Sinister was published by Seren in May 2008. He has written two novels for the Doctor Who New Series Adventures: The Taking of Chelsea 426, featuring the Tenth Doctor, and Night of the Humans, featuring the Eleventh Doctor and Amy Pond.